RCP Vision holds courses on the following topics, but We also offer custom training packages on specific customer needs as well. The courses alternate short theoretical and practical sessions, during which participants will carry out practical examples. For more information please send an email to training@rcp-vision.com or press the button below. This course covers fundamentals of java programming language, the basic concepts and the essential libraries. At the end of the course the participants will be able to create simple Java applications on their own. This course provides an overview of techniques and technologies required to build complex applications, Web and Desktop. This course provides an overview of new features of Java 8. Main topics will be lambdas, streams and basic techinques of functional programming with practical examples. This course provides an overview of new APIs and modularity system of Java 9. Main topics: Jigsaw Project, HTTP 2.0 and Process API. 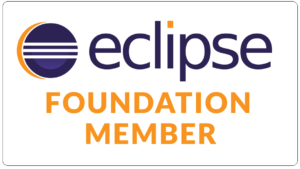 This course provides the foundation for understanding how to build an application with Eclipse RCP. At the end of the course the participants will be able to create Eclipse applications and plugins. For those already familiar with the development of rich client applications with Eclipse RCP, these three intensive days are designed to learn more about frameworks and the use of more advanced techniques. This course will help you understand how to implement your own application based on the Eclipse 4 platform. This course provides all tools to migrate an Eclipse 3.x application to the new e4 (Eclipse 4 ) platform. Focus on a medelod workbench and EMF. Description:Â This course will help you understand how to implement your own application based on the Eclipse 4 platform. The Eclipse 4 release significantly changes the programming model for Eclipse RCP development. The course explains the existing core frameworks in Eclipse, e.g. SWT, databinding, plug-in architecture, extension point, etc. as well as the new Eclipse 4 platform concepts, e.g. dependency injection, declarative styling, service consumption, the application model, the rendering framework, etc. This course also covers application lifecycle questions, like application updates and headless builds. Participants will create a complete standalone application to familiarize themselves with the different concepts. EMF is the Eclipse framework for modeling and code generation facility for development of applications based on structured data models. This training leads the attendees into the internal details of EMF runtime, dealing with model transformations, tips & tricks. Learn hwo to build powerfull interfaces upon your EMF models with built-in components and easy customizations. Sirius is an Eclipse project which allows you to easily create your own graphical modeling workbench by leveraging the Eclipse Modeling technologies. Xtend is a flexible and expressive dialect of Java, which compiles into readable Java 5 compatible source code. Get productive and write beautiful code with powerful macros, lambdas, operator overloading and many more modern language features. Description: EMF is the Eclipse framework for modeling and code generation facility for development of applications based on structured data models. Starting from a specification described in XMI (XML Metamodel Interchange, standard UML 2 format), EMF provides tools for code generation and a runtime library that can be managed with visual design tools.Â The course provides an overview of the basic concepts of EMF. Participants will have the opportunity to apply theoretical content in many practical exercises. OSGI Alliance defines the specification for modularity in Java. The course covers fundamentals of OSGI as well as intermediate topics and specific features of Equinox implementation. This training will address modularity in OSGI and in Java 9, going deep into pros and cons of both aspects. Learn how to be agile! This trainig focus on Agile techniques, what can be used to improove collaboration and work organization. This training addresses DevOps fundamentals: good practices, needed changes, automatic tools and lean processes. As a part of Agile techiques, TDD is something the every developer should know very well. This course will teach you how to change your everyday work. GWT is used by many products at Google, including Google AdWords and Google Wallet. This training will focus on all aspects of this Technologies. This training will focus on all aspect of Angular framework, including Typescript.